12 If I have told you earthly things, and ye (You all) believe not, how shall ye believe, if I tell you of heavenly things? 13 And no man hath ascended up to heaven, but he that came down from heaven, even the Son of man which is in heaven. 14 And as Moses lifted up the serpent in the wilderness, even so must the Son of man be lifted up: 15 that whosoever believeth in him should not perish, but have eternal life. John 3: 12-15. Vs. 13. 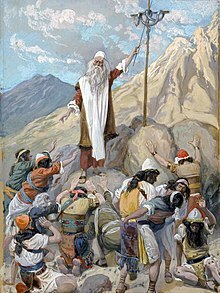 -Our Lord most probably spoke to correct a false notion among the Jews (that is still taught today by Talmud & Kabbalah), that said Moses had ascended to heaven, in order to get the law, a misinterpretation of Deut. 30:12 & Ex.24:18. See also Prov.30:4. (Judaism teaches Moses also ascended after his death, Babylonian Talmud Yoma 4a). But the bible says: God buried Moses in an unmarked grave (Deut. 34:6). No man went to heaven on their own except God took them (e.g. Enoch & Elijah). Only Christ can teach us heavenly (spiritual) things & with authority because He came from heaven & He is the Son of God. Vs. 14. -All the Jews knew well about the serpent that Moses made, event recorded in book of Numbers. Jesus uses this illustration to signify He would die on a cross for our sins, John 12:33. “5 The people spoke against God and against Moses, “Why have you brought us up from Egypt to die in the wilderness? For there is no bread or water, and our soul loathes this worthless manna. We all know Jesus is the bread from heaven, the real manna (John 6:41-51) He is the Rock (1 Cor.4:10), source of the water which represents the Word of God (Him) & the work of the Holy Spirit. The descendants of Esau (Edom) had denied Israel permission to cross their land on their way to Canaan. Then Moses & the Israelites had to make a longer journey surrounding the land of Edom (Num.21:4). The discouraged Israelites started to grumble & complain about God’s provision, showing their lack of faith (even after crossing the Red Sea). Because of their sin, just like their poisonous words, God sent them poisonous snakes, which represented their sin & its consequence, death. ‘ the wages of sin is death‘ (Rom.6:23). People understood, repented & confessed their sin vs.7. Moses interceded for them & made a replica of the poisonous snake out of bronze & put it on a pole. Everyone who was bitten or dying would look at the bronze serpent & live. In the same way, everyone dying from the consequences of sin, will look in faith (John 3:15) at Jesus’ sacrifice on the cross (our mediator & intercessor), and live. To be saved one must begin by acknowledging our sin & our need of a Savior. Note: The personal pronoun ‘he’ is not in the original Greek text. Jesus is saying I AM! God’s name given to Moises Ex.3:13-14!!! They didn’t grab stones when Jesus called them sons of the devil vs.44 but decided that He was blaspheming when He said I AM vs. 58) and that He should be stoned (according to their law). “Now judgment is upon this world. Now the ruler of this world will be cast out. 32 And if I be lifted up from the earth, I will draw all men to Myself. 33 He said this to signify by what kind of death He would die.” John 12:31-33. – We need to repent from our sins and go to God. He sent His son that whosoever believes in Him should not perish, but have eternal life. – We need to know who is Jesus. He isn’t just a good teacher or a great man. He is God! He is the Messiah, the promised Seed! You may have heard some people teaching that Jesus is the snake at the pole, others say, that He became a sinner (took on a sin nature) at the cross! Benny Hinn one proponent of that doctrine, stated: “Hear this! He who is the nature of God became the nature of Satan when he became sin!” (Benny Hinn, Trinity Broadcasting Network, December 1, 1990). His friend Kenneth Copeland have same teachings. He said: “The righteousness of God was made to be sin. He accepted the sin nature of Satan in His own spirit.” & then quotes Isaiah 53:10-11. (Kenneth Copeland, “What Happened from the Cross to the Throne,” 1990, audiotape #02-0017, side 2) . Our righteousness is IN HIM, not apart from Him!! Many think they can grab Jesus righteousness & walk away from Him (& still be saved), but that’s not possible, Jesus IS our Righteousness, our Salvation, apart from Him we can do nothing! (John 15:5). A/ First of all, Jesus Christ as God is immutable (Hebrews 13:8; Malachi 3:6), and cannot change in His divine nature. Hebrews 1:12. “ For such a High Priest was fitting for us, for He is holy, innocent, UNDEFILED, separate from sinners, and is higher than the heavens.” Hebrew 7:26. Jesus was without sin (1 John 3:5, 1 Peter 2:22, 1 Peter 1:18-19, etc.). B/ Some explain that He became sin judicially, not in nature. But please, also keep always in mind the Old Testament concept of expiation or sin offering. From the beginning, clean & innocent blood was necessary to cover sin. “without the shedding of blood there is no forgiveness.” (Heb. 9:22). When Adam & Eve sinned they tried to cover themselves making aprons with fig leaves (their own works), but God clothed them with the skin of a sacrificed animal (Gen.3:21). The sacrificial animal always had to be “without defect” (Exodus 12:5-7, Leviticus 4:3, 23, 32). The unblemished animal did not became of sinful nature or blemished; on the contrary, it’s innocent blood was necessary to cover the sins of the people. Animal sacrifices could only cover sins, but could not remove them. Hebrews 10:4. The root of the Hebrew word ‘kaphar’ H3722 translated “atonement” has the idea of “covering,” not removal. But when Christ shed His own Holy blood, it was once and for all a perfect sacrifice that removes, washes sins away. (Revelation 1:5, 7:14, 22:14, etc) -(G3068, G4150). If Christ became a sinner at the cross, then how could sinful blood clean sins? How can we become righteous IN Him? Could a sinner enter the Holy place? Of course NOT! Please, don’t believe them those are blasphemies! C/ In Lev.4:24 the Hebrew word ‘chattath’ H2403 could mean both sin or sin offering (expiation), one of the corresponding Greek words is G266 hamartia, the same word used by the apostle Paul (who new well both Hebrew & Greek) in 2 Cor.5:21. Sin-offering is an alternate meaning of the word ‘hamartia’, found in the Greek ‘Old Testament’ or Septuagint. The Septuagint translates the Hebrew ‘chattath’ with the Greek word ‘hamartia’ in ninety-four places in Exodus, Leviticus, and Numbers, where a sin-offering is meant. Also if we read the translation made by the ‘Orthodox Jewish Bible’, & of ‘Complete Jewish Bible’, in 2 Cor. 5:21 they also translate ‘G266 hamartia’ as an equivalent to Hebrew word ‘chattath’ H2403= sin offering !! “The one who in his person had no sin, this one Hashem made a sin offering on our behalf“. 2 Cor. 5:21 – Which is in accordance with the Scripture (Isaiah 53:10). Very important to understand that was not the serpent on the pole that brought healing and saved the Israelites from certain death, but the power of God! They needed to believe what God told Moises & look up for redemption. Years later the people of Israel started worshiping the snake of bronze, & the snake was destroyed by king Hezekiah (2 Kings 18:3). But unfortunately it didn’t end there, and the worship to the snake still continues to this very day! We must never worship the tools or the people God chooses to use, but always bring the honor and glory to God alone! Because they rejected Jesus Christ, they are ready to receive the Antichrist (John 5:43). Please brethren be careful, & avoid Jewish fables! Titus 1:14.